As a piece in the new Texas Monthly illustrates, the traditional coming-of-age ceremony is becoming more elaborate all the time. To watchers of MTV, elaborate parties for spoiled kids is nothing new. What sets a quinceañera apart, of course, is the religious element: in addition to ushering a girl to womanhood, it reaffirms her commitment to the church and involves a mass and a blessing. And the quinceañera involves a tacit element of sexual purity which parents in the article are quick to acknowledge. One mother says that she wanted her daughter to wear white because "it was the only time I could take her to the altar to be blessed and know that she was still pure." Whereas (tiny British dads aside) we hope that no one really thinks of a 13-year-old Bar Mitzvah as a man, the exchange of a doll for a bouquet, in the case of a 15-year-old girl, is more loaded: in the old days, the ceremony meant she was marriageable, and even now it's an ambiguous age between child and teen. Elaborate quinceañeras are becoming the norm in communities like Rio Grande Valley, where even families of modest income budget for big parties. The parties used to be homegrown affairs, but that won't do these days. Part of this is a natural consequence of assimilation on the part of immigrants: Americans like parties big and showy. Some in the article suggest that it may have something to do with the fact that girls are marrying later, if at all; some of a wedding's emphasis is now placed on the quinceañera. As one girl puts it, "You don't know if you're ever going to get married, but everyone turns fifteen." The price of each gown, which the emcee did not divulge, ranged from $500 to $800. And that's just to outfit the birthday girl. She typically has fourteen damas, or attendants (one for each year of her life), who, like bridesmaids, wear identical dresses and may change into additional dresses or costumes if la quinceañera is performing a choreographed dance number as part of her debut. There are also the chambelans, the young men who serve as the damas' escorts, who usually rent tuxedos for the occasion. 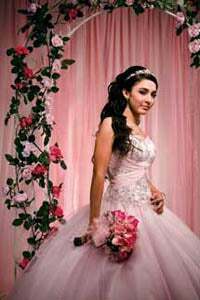 The piece profiles one quinceañera, Elizabeth Miranda, whose "pink diamond"-theme party, is complete with visits to the giant "Latina Bridal and Quince Girl Expo" and the full complement of court, party, and dance routines. Elizabeth seems generally interested in honoring her Mexican culture, but is clearly psyched about being queen for a day. While her quinceañera's a far cry from some of the parties the piece describes - a particularly horrifying Phantom of the Opera-themed event springs to mind - it's a big deal. Indeed, some of the boys have been in so many of the ceremonies that they know the dance routines cold. As the author describes it, it's a thrilling day for a girl, and she really is getting the royal treatment. It is like a wedding, and while we can see the appeal, it's worrisome enough when an adult bride focuses all her energies on the superficials of one big day. Isn't it that much harder when that day comes so much sooner, and so is over so much earlier? As the ceremony indicates, 15 is just the beginning.